Zombie books are many, and to be honest there is not a lot of variation in them, though I do love them (oh how I love them!). The Trip by Tim Morgan offered something that on the surface sounded a little different. Three High School friends; Dave, Chris and Meghan have planned for years a cycling trip during the summer between finishing School and going to College. They are to cycle from Massachusetts to Seattle, Washington. Leading up to their trip the news is full of reports of a super flu sweeping the globe but the teens pay it hardly any heed. Halfway into their journey it becomes apparent that the disease has reached America, the virus actually turns its victims into flesh eating ghouls. Stuck in a refugee camp with no sign of salvation the trio decide to do the insane; head back to Massachusetts on bike through the ruined, apocalyptic landscape to be with their families. What I loved most about this book was how it melded the past with the present. The present deals with the friends journey home, forever facing impossible odds as they cycle the hundreds and hundreds of miles home. The past deals with the lead up to the trip, culminating with their decision to leave the refugee camp they found themselves in. The past chapters mostly start with a news report giving a broad sign of what effect the virus is having on the worlds population. Going into The Trip I discovered that I did not really like either of the three main characters, initially I thought this was down to bad writing, but it actually isn't, I ate my humble pie. The three characters are flawed, they argue, they bicker , they make terrible decisions but they come across as human. Chris the meat head jock prior to the trip got diagnosed as HIV positive. This actually gives a good spin on the zombie tale for his character. As far as Chris is concerned the world ended for him a few months before it ended for real. He sees himself as a dead man walking so apocalypse is slightly easier for him to swallow. Meghan and Dave are both decent people, Dave with a crush on Meghan giving him a protective status. For the majority of the book I was groaning almost as loud as the ever present zombies at the trios amazing stupid decisions. First off they decided to cycle home which is crazy. There are cars literally everywhere and they are all able to drive yet there is only ever a few mentions to why they don't just use a car. A brief mention early on about it 'being wrong' to steal a car, while later in the book mention is made to the fact that they don't know how to hot wire a car. The thousands of cars they pass at least one must have been in working order with keys available. Instead the three are content to cycle literally through hordes of zombies. Look at the cover; that is literally what the group see as a good idea. They drive through mine filled cities rather than go around (so as to save time) and just sweep and swerve through groups of undead thousands strong (whenever they see zombies they nearly always describe them as thousands strong, I put this down to their young minds exaggerating). Most damning is the teens decision to go on the trip in the first place when if they paid any attention to the news they would have seen far earlier on that maybe a cycling holiday in the midst of human apocalypse was not a good idea. The teens are only just becoming adults so you get Dave wanting to impress Meghan constantly, Meghan chastising the others for daring to suggest that zombie apocalypse is proof of no God, or a God that has abandoned them, Dave and Chris getting into a fist fight while surrounded by charging zombies. All 3 are quite immature, it is a remarkable fluke that they managed to get on so well. Sure spending such a stressful time on the road together is bound to create tension but despite this they are a tight unit. They stick to their destination, holding belief that despite the devastation around them their home town could not possibly be affected. Despite the sheer number of zombies they are very rarely ever seen in isolation, they are a faceless mob for the most part, they may be runners but they are most certainly dead, often described as crawling with maggots. It was quite refreshing how convincing the group are in regards to the zombies. Usually even the average guy has racked up quite a number of kills in the course of a zombie tale, here there are only actually 3 kills, one of these occurs between paragraphs, while one of the others may actually have been an accidental murder. A lot more realistic it has to be said. If I had one complaint about the story it would be that I was kinda disappointed by the ending, obviously I wont spoil it here but was a shame it ended like it did, I saw the story heading to one of two points, it went to neither opting for a traditional plot device instead. Can't fault the writing though, this was easy to read, but exciting and interesting getting a teens perspective on things. Road trip stories are rarely bad. 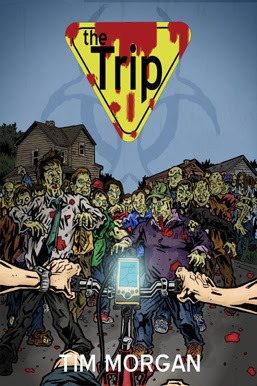 The Trip is a good zombie novel, well written, interesting and you feel for the characters despite their short comings. Recommended reading if your after something that isn't the usual guns and grimness!